Nativist Ann Coulter is the high priestess of the Alt-Right and arguably Donald Trump’s most senior advisor. 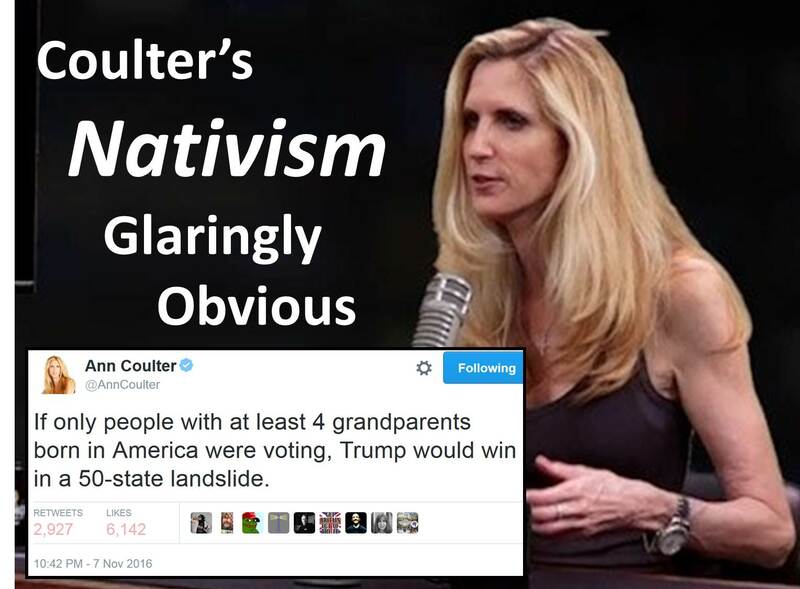 Coulter’s tweets, on the eve of the election, decisively demonstrate both her nativism and her lack of logic. Ann Coulter (10:42 p.m.): If only people with at least 4 grandparents born in America were voting, Trump would win in a 50-state landslide. 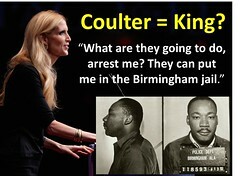 Coulter’s argument is entirely race-based. She desires racial homogeneity. She has long sought to restore a (white) WASP America. Erin McCormick (11:09 p.m.): “At LEAST four grandparents” it’s physically impossible to have more than four though? Ann Coulter (11:12 p.m.): There’s 8 great grandparents, 16 great-great grandparents, etc. Yes, she explained what she meant of tweet. Her explanation further solidifies her intent toward racial (white) homogeneity. 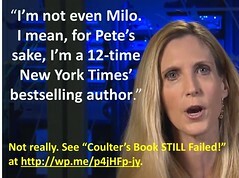 Confronted with a quandary arising because Trump himself is a second-generation immigrant, Coulter claimed that fact to be irrelevant. Ann Coulter (11:24 p.m.): So what? You are like “Politifact,” citing irrelevancies as if they detract from blinding truth of my statement. First, “real Americans” wouldn’t vote for Trump, a candidate who eschews the Constitution, the rule of law, Christianity, and American principles and ideals. Second, Trump – and Trump alone – is the only “Republican” presidential candidate who could possibly lose to Hillary Clinton.